Normally, my hockey games in Richmond do not involve eats afterwards. Yes, it is a sad reality that the group I play with isn't all that interested in eating a big meal just before bedtime. Such amateurs! C'mon, where else would you make up for all those burned calories??? Hence, when there was a random pickup game including the likes of Milhouse, Gadget Girl and Emilicious, I knew there would be more than just hockey. 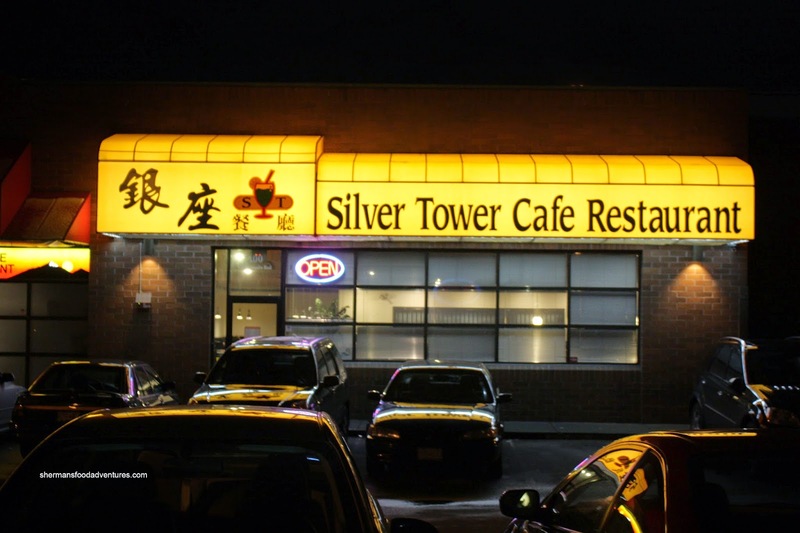 As a result, we went out in search for late night eats and ended up at Silver Tower. With the nightmare of Golden Oscar's cream of tuna fresh in my mind, I was a little hesitant with another cream soup, but I did it anyways. The Cream of Chicken was really quite bland while the broth itself was not that creamy. 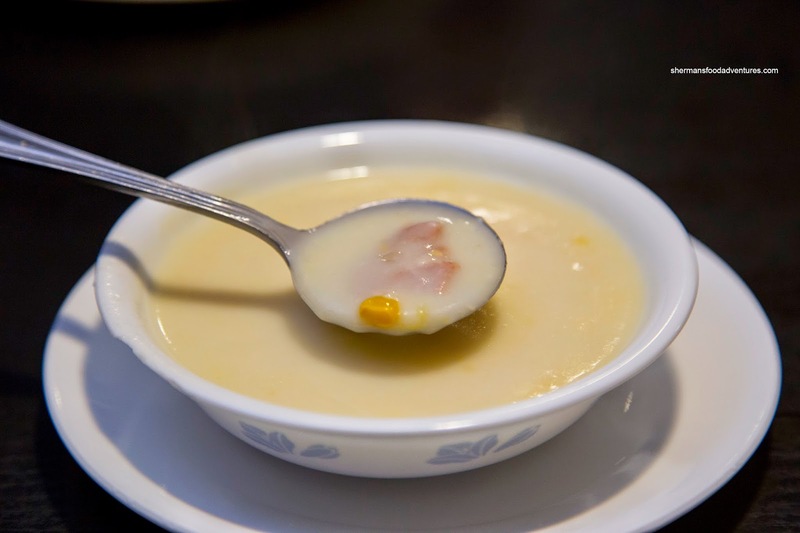 Of course any cream soups in HK-style cafes are more starch-thickened than anything else. At the very least, the bits of meat were chicken, not tuna. The soup was part of the "Choose 3 Meats" meal where I went for Ox-Tongue, Chicken Steak and Fried Basa. I went for black pepper sauce and spaghetti for my side. I found the meats to be quite good as the tongue was soft yet still maintaining an appealing chewiness. Again, I offered it to Emilicious and Gadget Girl, but they gave me dirty looks. Milhouse, on the other hand, seemed like the only willing partner... The chicken steak was juicy with a nice sear on the skin side. My favourite was the fried basa as the fish was moist and flaky while the breading was super crunchy. 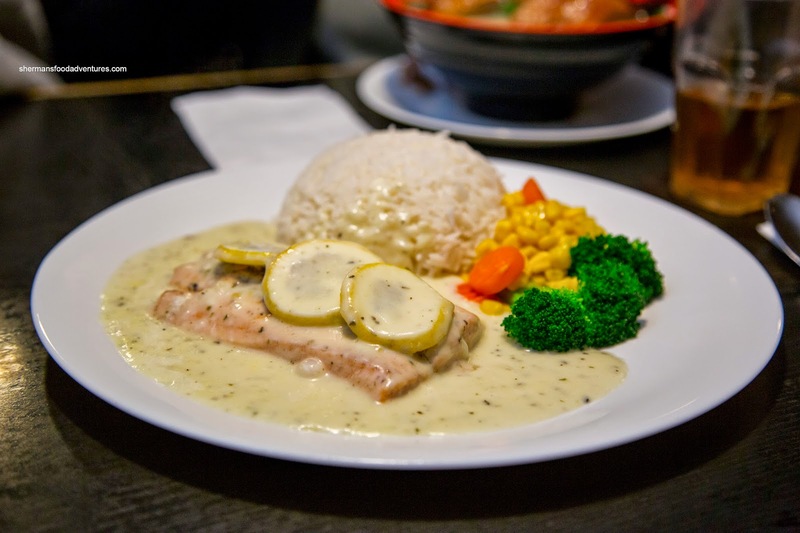 Unlike other places, the black pepper sauce was actually spicy and flavourful. Gadget Girl and Emilicious both had the BBQ Duck Lai Fun to my chagrin (cursed duplicates!). 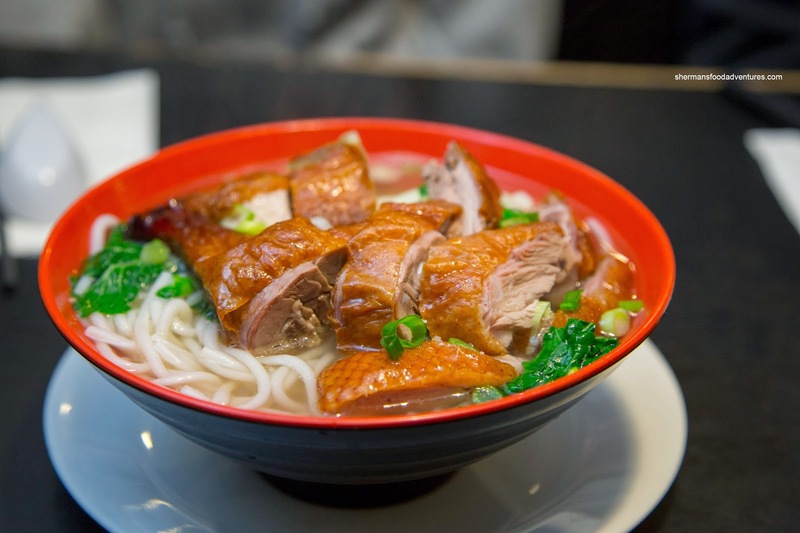 Blessed with a bounty of tender and moist BBQ Duck, it was a satisfying bowl of noodles. The broth was fairly light and clean-tasting. There wasn't really any distinguishing flavours nor was there any body, but at least it wasn't salty. Milhouse tried to channel the menu from Cattle Cafe and went for the Salmon in Cream Sauce. This was actually quite bland with a sauce that only exhibited the mildest lemon hit. As for the salmon itself, it was okay where it wasn't overly dry. However, in general, he was not really impressed with the dish and looked longingly at my tongue... Ox tongue! On another visit with Milhouse and JuJu, I decided to try 2 dishes including a HK-style cafe staple being the Baked Pork Chop Rice. 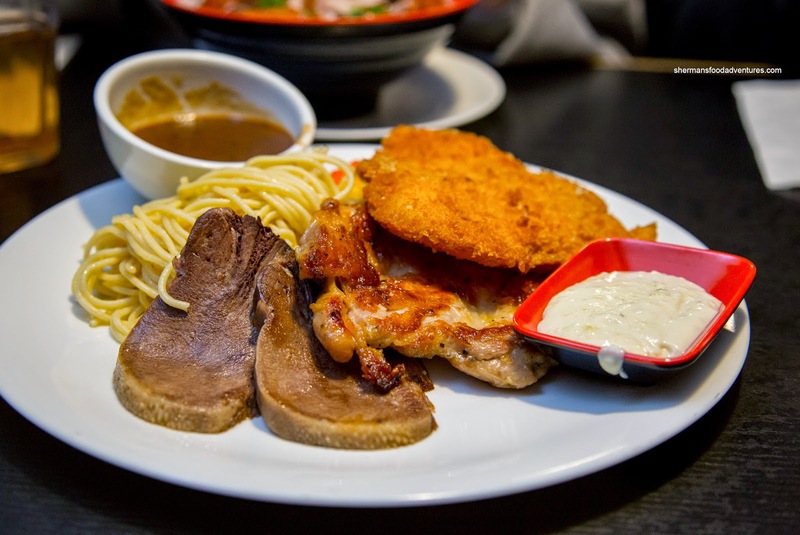 I found the pork chop to be large and fried beautifully where it was still crispy despite the plethora of sauce. 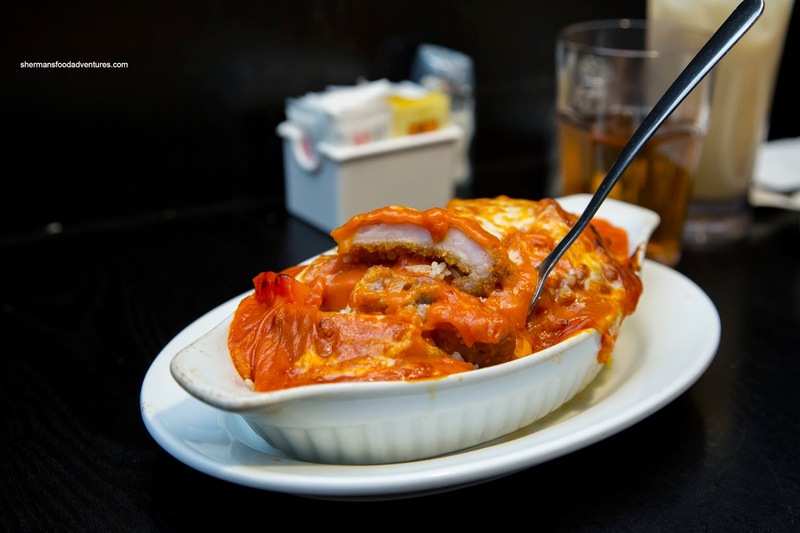 It was tenderized properly where there was still meat texture while still being tender and not lacking moisture. As for the sauce, it was slightly tart and not overly sweet. I also got the Satay Beef with Vermicelli Hot Pot. There was a fairly generous portion of sliced tender beef where it had a bounce texture. It was well-seasoned and only slightly spicy. I found there was just too much onion and green peppers for the vermicelli to be noticed. 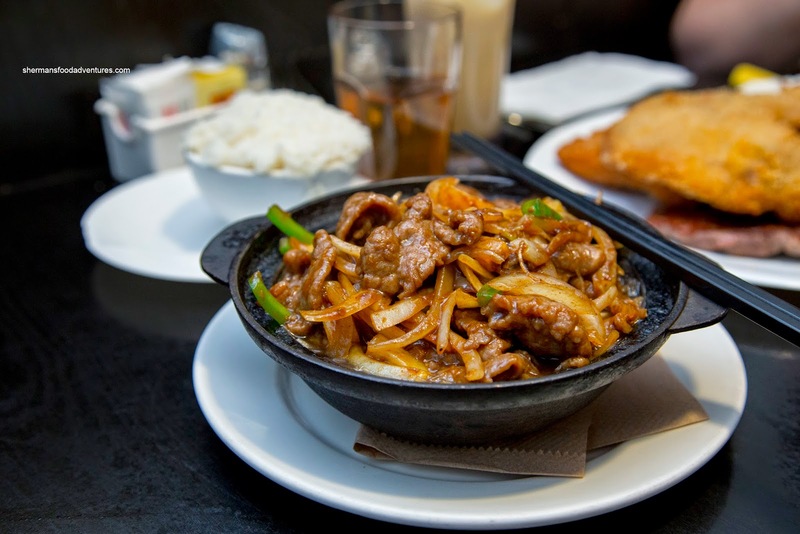 Overall, from the dishes we sampled, Silver Tower can be considered a viable option for late night HK-style eats, particularly in Richmond.